We’d love your help. Let us know what’s wrong with this preview of The Oxford History of the Classical World by John Boardman. The history, achievements & legacies of Greek & Roman antiquity come to life in the pages of this comprehensive & beautifully illustrated volume. Following a format similar to that of The Oxford Illustrated History of Britain, this brings together the work of 30 authorities & organizes their contributions into three main sections. The 1st covers Greece from The history, achievements & legacies of Greek & Roman antiquity come to life in the pages of this comprehensive & beautifully illustrated volume. Following a format similar to that of The Oxford Illustrated History of Britain, this brings together the work of 30 authorities & organizes their contributions into three main sections. The 1st covers Greece from the 8th to the 4th centuries, a period unparalleled in history for its brilliance in literature, philosophy & the visual arts. The 2nd deals with the Hellenization of the Middle East by the monarchies established in the areas conquered by Alexander the Great, the growth of Rome & the impact of the two cultures on one another. The 3rd covers the foundation of the Roman Empire by Augustus & its consolidation in the 1st two centuries AD. A concluding essay discusses certain aspects of the later Empire & its influence on Western civilization, notably thru the adoption of Christianity. Within each section, chapters dealing with political & social history alternate with ones on literature, philosophy & the arts. Maps & chronological charts--not to mention over 250 illustrations, 16 in color--enrich the basic text, along with bibliographies & an index. 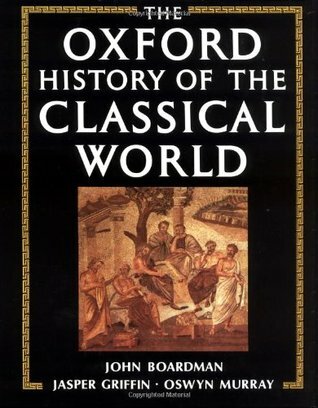 To ask other readers questions about The Oxford History of the Classical World, please sign up. A very ambitious book trying to explore all different facets of ancient western civilization (Greece and Rome - the latter with a focus primarily on the late Republican and Early Empire periods). While political and military history are (to some extent) covered by this book, a significant part is actually dedicated to complementary aspects such as society structure and evolution, economy, literature, art and culture, philosophy and religion. The book does not present a uniform, continuous narrative (there is no strict timeline throughout the reading), and it is structured as a series of essays by different authors. Because of this approach, and because of the overambitious nature of this book (I think it is just impossible to cover all these facets of ancient Western Civilization in just one book, even a book of 900 pages like this one), the quality and level of detail fluctuate significantly from one subject to another: for example, some periods and subjects (such as Late Antiquity, or Neoplatonic philosophy) are just barely touched and leave the more knowledgeable reader quite dissatisfied. If you are after a detailed scholarly treatment of these subjects , then I am afraid that this is probably not the best book for you - I must say that there is little that I did not already know, and which I already found elsewhere treated at a significantly deeper level of detail. A range of academic essays dealing with many aspects of the histories of the Greeks, the Hellenic era and the Romans, while not actually getting around to narrating most of their stories, without which it all seems a bit ... academic. There seem to me to be significant gaps in the topics covered, such as Roman sponsorship of early Christianity, and description of the later period seems especially sketchy. I worry a lot about implying that the Greek and Roman worlds can be taken as the sum of our A range of academic essays dealing with many aspects of the histories of the Greeks, the Hellenic era and the Romans, while not actually getting around to narrating most of their stories, without which it all seems a bit ... academic. There seem to me to be significant gaps in the topics covered, such as Roman sponsorship of early Christianity, and description of the later period seems especially sketchy. I worry a lot about implying that the Greek and Roman worlds can be taken as the sum of our ancient history, even in Europe. The early essays do in fact make clear that while the Greeks were getting around to forming their civilisation, they lived in the ruins of older societies and learned from existing, thriving cultures around the Mediterranean and beyond. The Romans in turn were not so much the heirs of Greek civilisation as its conqueror. The Roman destruction of both Corinth and Carthage represented the triumph of brute force, not the onward march of Western enlightenment. Greek culture arrived in Rome as war booty. There are enough interesting essays to make the book pleasing to read but for the many exciting and colourful stories it ignores, maybe we just have to turn to YouTube and the History Channel. Obviously, an academic can assume that other academic readers already know the basic story of the people and periods they describe and I appreciate that the university staff can knock out some weighty history tomes by making a swift trawl through their filing cabinets (has anyone got an essay about Roman architecture?) but a few more concessions to the general reader would surely be worth making. On the whole this volume seems to me to represent the smug and self satisfied blather of the over confident academic. 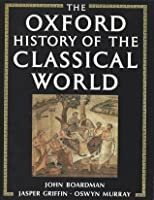 It is as though both the "Classical World" as defined here, and the elite university sponsoring this tome, were too big and too dominant to be questioned in a critical way - a modern plutocracy appealing to an ancient plutocracy. Phew, what a ride. This book is split up into two parts: Greek civilization, and primary Republican Rome. As far as the entirety of the 'classical world', its primary focus is on these two sovereigns, with some insight into other people from those perspectives. There is no strict timeline throughout the reading; and it is mostly structured around cultural contrasts, where new ideas are introduced as needed. It is clear this is not a political, or military historical perspective; much if anything Phew, what a ride. This book is split up into two parts: Greek civilization, and primary Republican Rome. As far as the entirety of the 'classical world', its primary focus is on these two sovereigns, with some insight into other people from those perspectives. There is no strict timeline throughout the reading; and it is mostly structured around cultural contrasts, where new ideas are introduced as needed. It is clear this is not a political, or military historical perspective; much if anything is sparse and quickly mentioned-- You won't learn much about the Persian wars, or the great battles with Hannibal. Again, this is a cultural review: from society, norms, philosophy and people. This is my first immersion with the Greek world, so I can not appreciate the details as much as a proficient reader would; but the Roman latter half is absolutely riveting. The final years of the Republic of Rome are written through a chapter dedicated to the orator, Cicero. The Greek-Latin linguistic affairs is fascinating, and the chapters on historical, and philosophical figures were my favorite-- likewise, in the Hellenistic first-half. Simply amazing. Recommended for anyone remotely interested in the classics. Obviously, Oxford University series "Oxford History of..." are amazing reference books. This particular text covers a great deal of material with black & white illustrations where possible. Writing a review is actually quite pathetic as it is such a scholarly and advanced book, there can be no true criticism. A cynical trade on Oxford's reputation. Each chapter is a discrete essay by a different author on a specific topic. Some essays are clumsy combinations of old lecture notes and journal articles. Some are the indifferent ghostwriting of the author's grad student. The chapter on the Imperial Era was, I kid you not, a long essay on how there was not an imperial bureaucracy. The best chapter in this book was, sadly, the first one. It was written by this guy. I look forward to reading his book. It's not terribly informative, and there are some pretty withering bits on philosophy. It's apparently impossible to produce a solid book for those allergic to historical sources (this is actually the real problem) with the exception of Thomas R. Martin's fabulous little beach read on Ancient Greece. That being said, Boardman and his cohorts are pretty fun to read. Most books are rated related to their usefulness and contributions to my research. I read this one off and on. It's a thorough review of all aspects of Greek and Roman history and culture.